As a Cannabis Practitioner and Coach I often speak with seniors like myself. I can honestly say that many, if not most, are very interested to learn about cannabis and how they might use it for themselves medicinally. Some have told me how they have had to deal with debilitating side effects from taking pharmaceutical drugs and don’t ever want to go through that again. Others are simply curious. 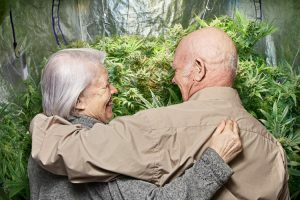 Seniors who take a stand against not wanting to get high typically fall into two main categories: Either they have never taken a puff of marijuana in their entire life, or overdid it, big time, as Baby Boomers in their youth. Non-psychoactive CBD offers many health benefits as I discuss here. The emphasis on CBD is largely due to its non-psychoactivity and the still-in-effect U.S. Government classification of cannabis as a Schedule 1 drug. Nonetheless many states have allowed CBD commerce, and marketers have taken full advantage selling CBD and its benefits. However, as a health practitioner, I find it incorrect to focus only on CBD. In keeping with the title of this article, I believe a little psychoactivity can increase the quality of life for senior. Besides THC’s physical benefits, its value as an anti-anxiety medicine cannot be overstated. How so? Therapeutically administered cannabis with some amount of THC allows us to briefly step outside of our everyday (default) pattern of thinking. With a bigger-picture view of our life’s issues and concerns, we discover the opportunity to consider a different way of looking at them. Why not get a new perspective and welcome sense of mental and emotional relief that calms us down? It’s possible and I hear the stories. Plus, when THC is used responsibly in a formula with CBD, the CBD has the bio-chemical effect of making the THC less disorienting and much more manageable. That said, each individual must find their own ‘sweet spot’ of what works for them, and only 10 states and DC have so far legalized THC. Oh, and by the way, laughing more once a little high might also be just what the doctor ordered! Thank you for addressing this issue. I hear the same comments when I talk with seniors about cannabis for health and well-being. THC in the right amount is a game changer for remembering what a sense of well-being feels like. That alone leads to better health supporting activities and choices. “…in the right amount.” If a little feels good, them more will feel fantastic. Right? Maybe for a short while. Moderation in all things. Like St. Paul endorsing a glass of wine for digestion. Not a whole bottle with dinner every night.